If you are in the market for a Bluetooth helmet but one that provides you with adequate protection, and is not too bulky to handle, then you definitely need the custom Bilt Techno Metropolis Bluetooth helmet. Ever get tired of not being able to stream live music or being unable to connect online when on the road? Well, with the new Bilt Bluetooth helmet that should not be an issue any longer. The neat feature about the Bilt Bluetooth helmet is that it comes with an easy charge option and with detachable visors which are quite easy to clip on and de-attach. One of the key issues when it comes to helmets is that most riders often face on long road trips is fogged up visors or overheating issues. 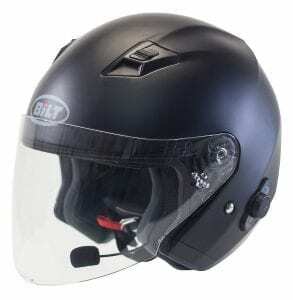 But the new Bilt techno metropolis Bluetooth helmet comes with multiple vents, which are quite easy to open and close and allows for optimal ventilation. This takes care of both the fogging and overheating issues. Apart from this, the helmet comes with an ultra-high-tech injection molded open sell which is resilient enough to withstand strong impacts and provides you with the protection you need. The helmet itself comes with advanced Bluetooth options including an easy charge option with the plug in located right at the back of the helmet. The outer shell comes in Matte black with a glossy finish as well as metallic paint with double lacquer. The helmet has been designed for sleek performance and is aerodynamically designed to do just that. The helmet comes with moisture wicking inner lining as well as a click and secure option for the strap making it easier to secure the helmet to the head. The neat thing about the Bluetooth Bilt helmet is that you can listen to music or any other form of online entertainment while on the road with ease. Better yet, the Bilt Bluetooth allows you to pair the helmet with other Bluetooth Bilt helmets so you can share the music with your pillion rider as well provided they have the same Bilt helmet on. The helmet also comes with a flappable and detachable visor and comes in both clear visor as well as tinted and mirrored variants. So you get to choose the visor as per your preference but the tinted ones can provide your eyes with the required protection from strong glares and UV rays. The visors come with clear, tinted as well as mirrored; you can completely flip it over or detach it by alternating between the C and O at the side of the helmet. Just toggle the key to open and press the button. You should be able to detach the visor now. The helmet comes with a large ventilation right in the front and two smaller vents on the side, and these vents are easy to operate and as a result of these vents, there are no fogging or overheating issues. The ventilation channels are situated at the front and at either sides of the helmet, ensuring you can breathe in properly even with the visor on and it does not make you feel suffocated. The helmet is engineered to reduce drag and wind resistance and thereby enabling you to travel at greater speeds. The aerodynamic design makes it perfect, and is custom built so that the helmet does not snag on the shirt or jacket but instead sits snugly on your head. The helmet comes in various sizes from small to large and is designed to give you a snug fit. It comes with an ultra high tech injection molded shell which provides you with better protection from impacts. The helmet comes with pads and multiple layering on the inside and also comes with high density foam providing you with an extra layer of protection from impacts and other forms of accidents. The Bilt Techno Metropolis Bluetooth helmet does score good on most fronts, a reason it is tagged as the ultimate biker’s companion – all with an affordable price tag.